you'll see a whole-lotta pictures of you, you and you! but the ZH's fingers got wrinkly 'n' tired sorting through the photo files. But even if you're not shown here, you still have a special place in our hearts! from Maggy, Zoey & Ann, the Zoolatry Girls. What a wonderful tribute for World Cat Day. It was so great to see all of my furriends and some new ones to visit. Special purrs for your mom and keeping her and your family in my thoughts. And happy world cat day to you my friends! What a fun World Cat Day posty. We hope you have a wonderful World Cat Day! Happy World Cat Day from all of us, and lots of purrs and universal Light to you all. We are sending special get well healing PURRS to yoor Poppy today and everyday until he is better. What a cute thinking cap! Have a great day and make sure to get extra snacks! 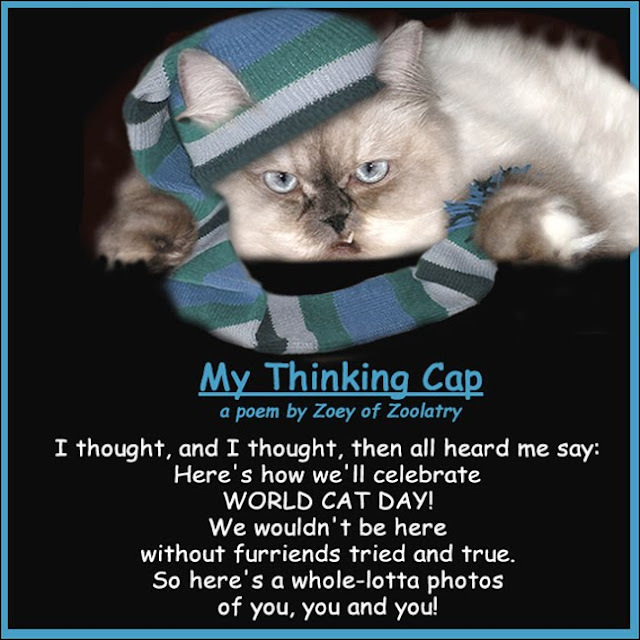 Happy World Cat Day to you, Zoey and Maggy and to all the wonderful cata all over the world. You have presented here a marvelous tribute to your many furiends. Yes, indeed - WHAT A WONDERFUL WORLD!!! 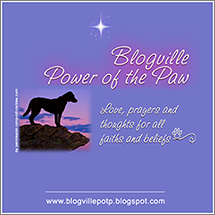 Maggy and Zoey - your mom did a great post there - it was lovely seeing the collages. Those are all so great!!! Happy World Cat Day to all of you!! Happy World Cat Day to all of you at Zoolatry! The collages are great - it was so nice to see so much of your mom's wonderful artwork. P.S. We're sending many purrs and healing thoughts to your dad. What a fabulous celebration of World Cat Day! The Zoolatry Human is so talented! We found ourselves in the photos! We're purring and praying for the ZH and for your Poppy. We just wanted to send our purrs and prayers for your Poppy! Together with all the purrs in the World of Cats, surely this will help him through. Our healing thoughts and empathy go out your way on this World Cat Day. We scrolled. So many cats. And they don't touch the surface of the blogging kitty pictures you had to sort through. Thanks for sharing them. We enjoyed seeing them again. HCD to you! Oh, what a joy it was to scroll through all of the wonderful kitties of the CB! All 9 of us kitties are purring our warmest and most healing purrs for your Poppa. Grete is wagging her tail because she says that helps too. Happy World Cat Day to you all!! And lots of purrrrs and purrayers for Poppy!! What a unique and special way to honor this day...that was fun to scroll down and look at all the photos and friends! And Chey has perked up enough to offer some purrs for your Poppy--and of course we can't stop the new kit from purring hardly at all! Happy World Cat day to all of you. Purrs and Purrayers for your Poppy. Happiest of World Cat Days to all of you!! Happy World Cat Day, furiends! This is a perfect post for World Cat Day! You girls are amazing. We are purring and purring for your Poppy. We are also sending many comforting thoughts to your family. Happy World Cat Day to you all!! Thanks for all the lovely pictures of all the kitty's, too!! Purrs & Purrayers to Poppy, and supportive vibes to you, and your family! What a great idea Zoey and the Zoolatry Human did a great job with the pictures. We loved them ALL. Sorry we didn't get to drop by yesterday, we had thunder boomies so Mommy turned the computer off. 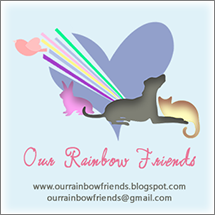 Thank you so furry mucho for including us in your celly-brations!